Gluten is the protein that grains produce in their seeds. Almost all grains have gluten. However, a gluten-free diet refers to the gluten found in wheat, barley and rye. The gluten in rice, corn and other plants is safe for people with gluten sensitivity and celiac disease to eat. Finding gluten free flour that makes delicious baked goods can be tricky. When gluten proteins in wheat, barley and rye combine during the baking process, they provide baked goods with flexibility and structure. Gluten also helps dough rise by trapping the gasses that yeast releases when fermenting. Gluten in other gains do not have these same abilities, making it difficult to find decent gluten free flour. The name buckwheat can be confusing because this plant is not a type of wheat. Instead, buckwheat is a fruit seed that is related to knotweed, rhubarb and sorrel. Baked goods made from buckwheat tend to have a crumbly texture. Combine this flour with another type of gluten-free flour, such as brown rice flour, to make the texture more smooth and moist. While almond meal contains ground whole almonds, almond flour is made with blanched almonds—almonds with the skins removed. This type of flour has a nutty taste. Usually, this flour can replace all-purpose or wheat flour, but it can make baked goods taste dry. Use an extra egg when baking with this type of flour to add more moisture. When you use this type of flour, your batter will be thicker, and the baked goods will be denser. Ground brown rice makes this type of whole-grain flour. Usually this flour is combined with other gluten free flours to create baked goods. This type of flour is high in protein, fiber and iron. Grinding whole-grain oats creates a flour that gives baked goods a chewy texture. Oat flour is high in Vitamin B, magnesium and protein. Since oats soak up liquid, only use this flour in small amounts and consider mixing it with other gluten free flours. Rich in magnesium and manganese, corn flour is a whole-grain flour made from ground corn. This type of flour comes in two different varieties: white and yellow. It is commonly used to make tortillas, bread and pizza crust. Coconut flour is a low-carb, fiber rich flour that is made from dried coconut and adds a mild coconut flavor to baked goods. Recipes using this coconut flour require more eggs that recipes using other types of flours because it absorbs a lot of liquid. 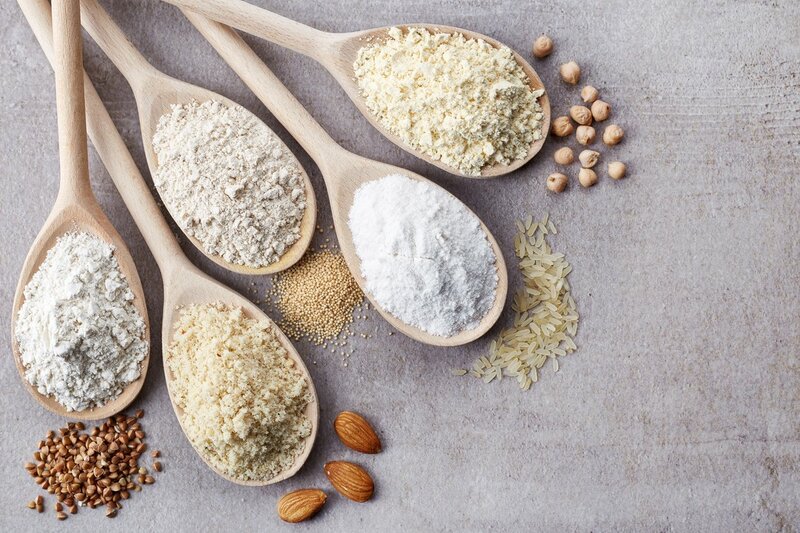 Since some of these types of flours can be contaminated depending on where the flour is processed, check that the product is gluten-free certified.